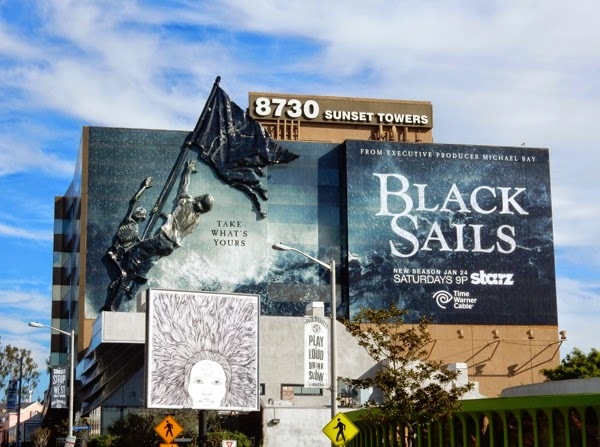 Starz pirate show, Black Sails, likes bringing the drama to the Sunset Strip each year it seems, as last year they staged a cannonball fight across the heavily trafficked commuter belt to kick off the series and this year they've built this giant-sized 3D installation to grab passersby attention. 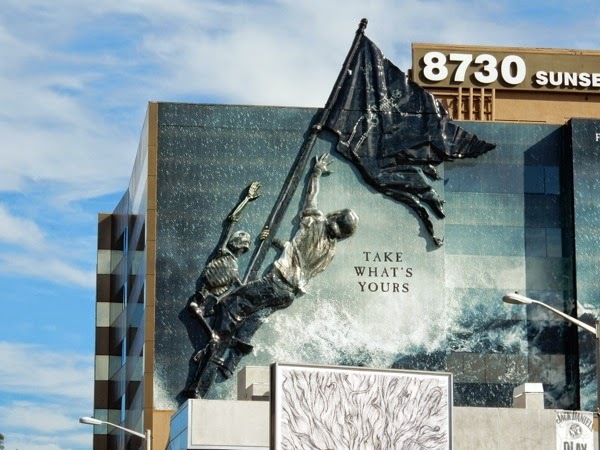 This embossed pirate flag really catches your eye as it's not only in 3D relief, but it also extends above the giant billboard space to stick out, almost as if someone was waving a flag to capture your interest. 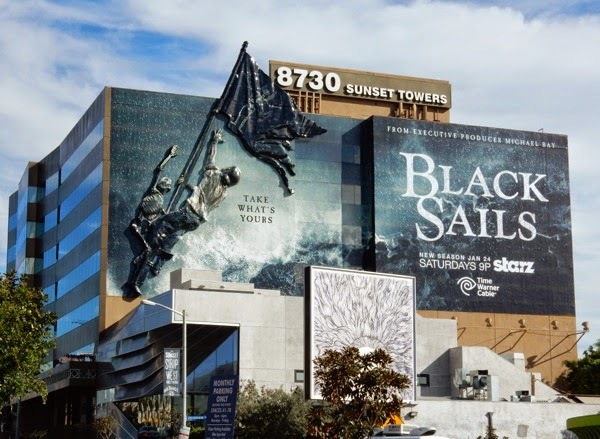 Are you ready for more adventures on the deadly, high seas set 20 years before Robert Louis Stevenson's Treasure Island novel? 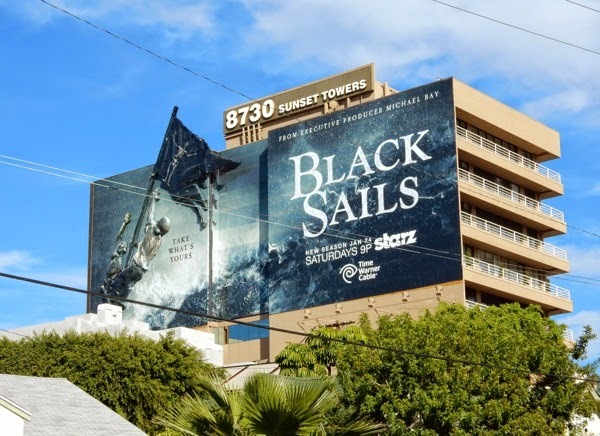 Yes, black is back, but things may not all be jolly on the high seas of early 18th century Caribbean, as it's time to take what's yours (whoever, or whatever, gets in your way). 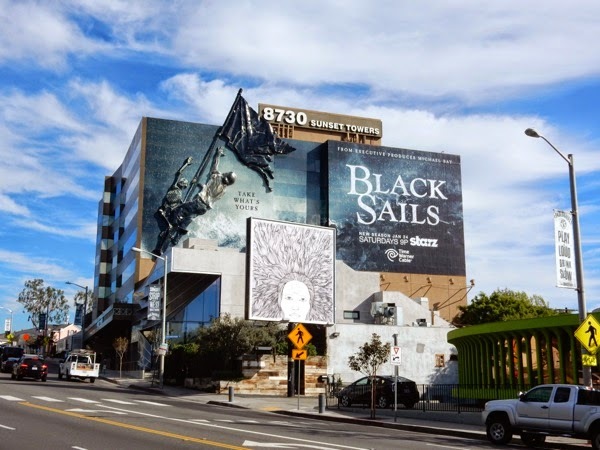 Looks like things may be getting even trickier for 'Captain Flint' and his crew, so expect some motivations for his pirating ways, plus more than your fair share of alliances, secrets and betrayals, not to mention more explosive action (well the period drama series is executive produced by Michael Bay after all). 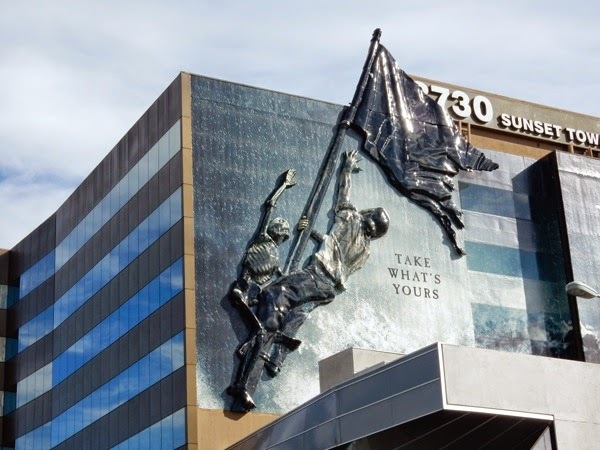 Meanwhile, here's also a look at the standard 2D version of the super-sized ad creative snapped on December 22, 2014, before the three-dimensional embellishments were added. 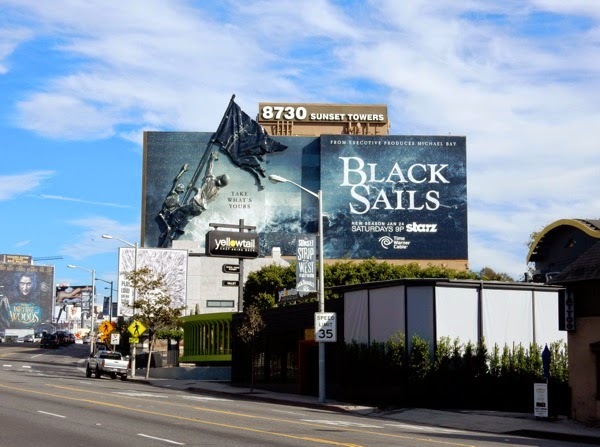 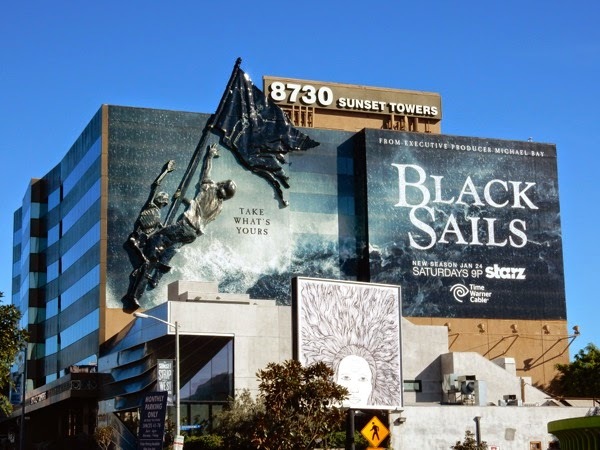 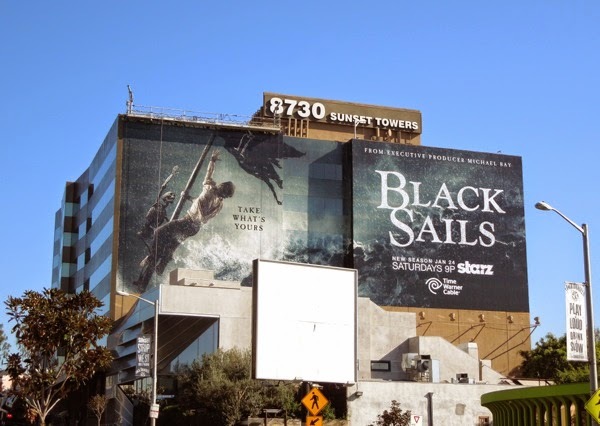 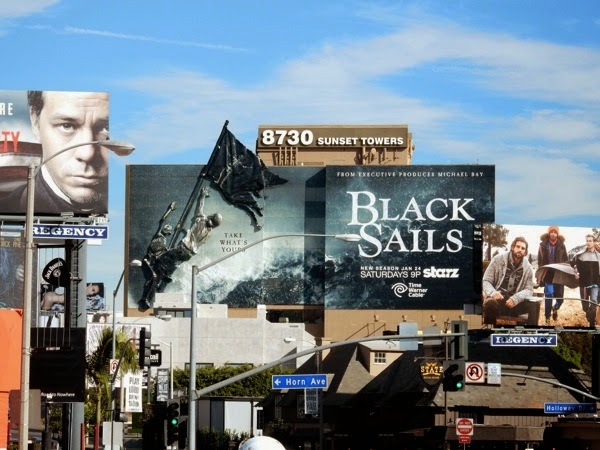 The completed 3D version was photographed on a cloudy January 7, 2015 and if you like this spectacular installation, be sure to take a look at the series launch outdoor ad campaign for Black Sails from early last year, which featured a clever progressive 3D cannonball fight which took place over consecutive weeks along the Sunset Strip. 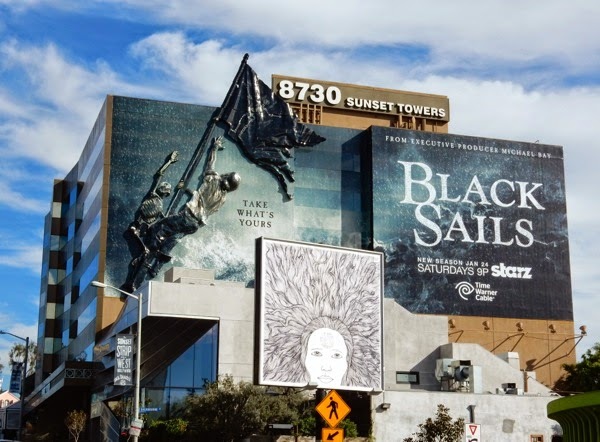 The swashbuckling show has already been renewed for a third season, so even things look turbulent at sea, you can also probably expect a killer cliffhanger by season's end to keep you hooked. 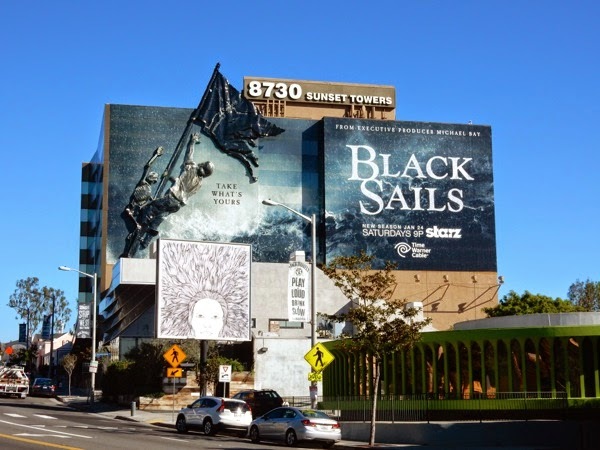 UPDATED: Here's another look at this special installation for the sophomore season of Starz pirate drama, snapped on a much clearer January 14, 2015.